For shock system parts (shock springs, jewels) see link at page bottom. This is the complete unit ready to be placed in the movement. 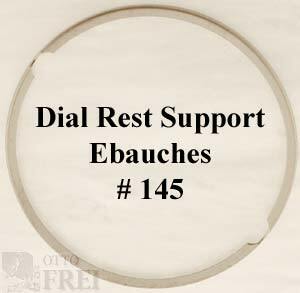 This barrel is supplied with arbor and mainspring installed. 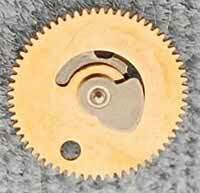 Now you will not have to open the barrel to install new mainspring when you can just replace the complete barrel. For ETA Calibers 2801, 2801-1, 2802, 2801-2, 2804, 2804-1, 2804-2, 2805, 2806, 2807, 2810, 2811, 2812, 2813, 2816, 2816-1, 2817, 2819, Tissot calibers 3051 & 3052. � This is the complete unit ready to be placed in the movement. This barrel is supplied with arbor and mainspring installed. 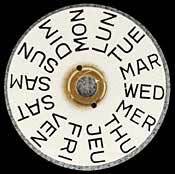 Now you will not have to open the barrel to install new mainspring when you can just replace the complete barrel. 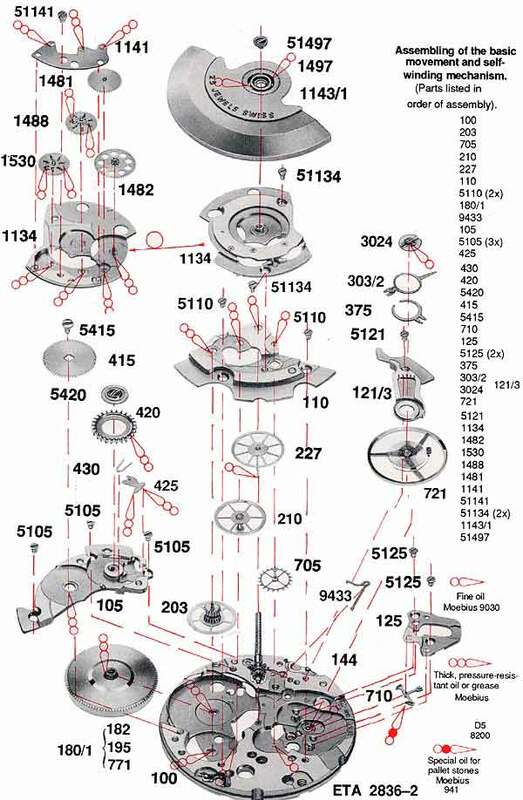 Special mainspring for automatic movements used by ETA, Benrus, Bulova, Hamilton, Longines, Lucien Picard, Movado and Tissot. 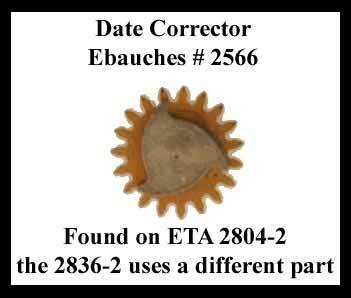 ETA Caliber's 2821, 2821-1, 2821-2, 2821R, 2822, 2824, 2824-1, 2824-2, 2824-A2, 2824R, 2825, 2825R, 2826, 2826R, 2827, 2827R, 2830, 2830R, 2831, 2831R, 2832, 2832R, 2834-1, 2834-2, 2834R, 2836, 2836-1, 2836-2, 2837, 2838, 2839. Tissot 3103, 3104, 3108, 3152. ETA 28,800 BPH Balance Complete to fit these popular calibers. Tissot 3051, 3052, 3103, 3104, 3108, 3152. Standard Balance Completes are sold without balance bridge attached. this is the normal way all balance completes are sold. 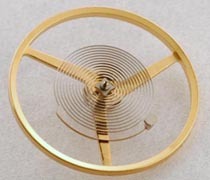 ETA calls this Height #1 for this base model and the hour wheel is 1.01 mm. ETA calls this height #1 for the base caliber. The Ht. 1 hour wheel goes with the Ht. 1 Cannon Pinion 1.95 mm and the Ht. 1 fourth wheel 4.85 mm. 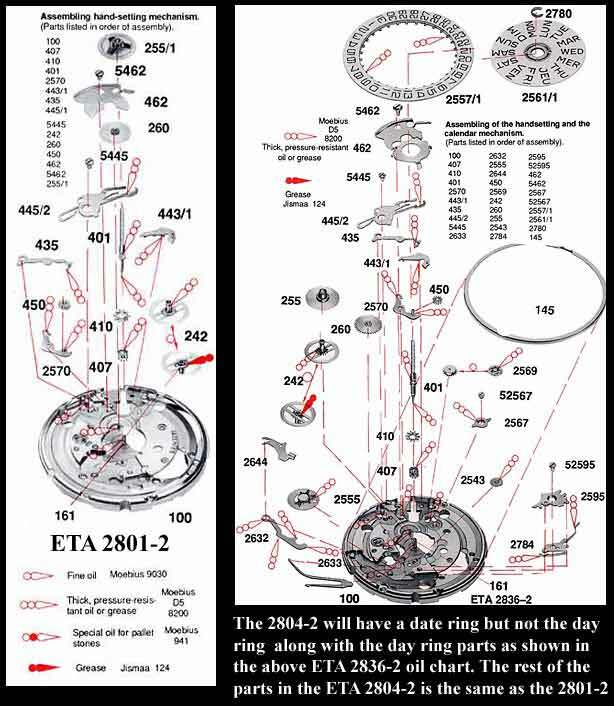 Normal height for ETA 2801-2 it is to be used with the 2.20 mm cannon pinion and the 5.07 mm Fourth Wheel on watches with sweep second hands. 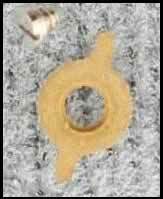 This 2.20 mm tall cannon pinion is the normal height for the ETA 2801-2 version with a sweep second hand. 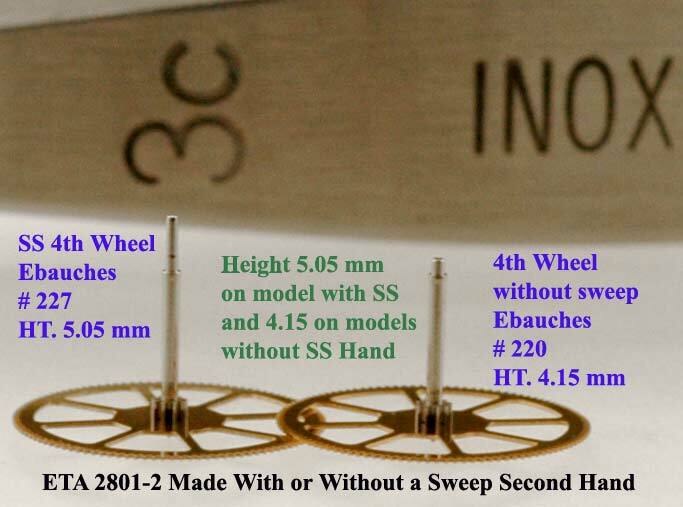 This height cannon pinion matches up with the height 1.25 mm Hour Wheel and the 5.05 mm Fourth Wheel. This is the lowest height for the ETA 2801-2, it goes with a 4.85 mm 4th wheel and 1.0 mm hour wheel. 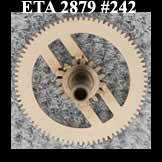 Clutch Wheel for ETA 2801-2, 2836-2, 2804-2 Also called "Sliding Pinion"
This is the normal height 2.7 mm for the ETA 2836-2, 2879, however it can also be use on the ETA 2801-2. Work also for 2836-2, SELLITA 210-1, SELLITA SW200-1, SELLITA SW220-1 and many other calibers. 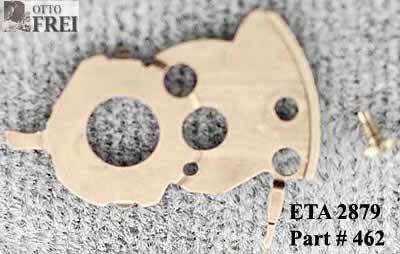 This part fits the ETA 2836-2 and about 200 other calibers made by AS, Bulova, Benrus, Elgin, FF, GP, Guren to name just a few of the makes. 2800, 2801, 2801-1, 2801-2, 2803, 2804, 2804-1, 2804-2, 2805, 2806, 2807, 2808, 2809, 2810, 2812, 2813. 2816, 2816-1, 2817, 2819, 2820, 2821, 2821-1, 2821-2, 2821R, 2822, 2824, 2824-1, 2824-2, 2824-A2, 2824R, 2825, 2825R, 2826, 2826R, 2827, 2827R, 2830, 2830R, 2831, 2831R, 2832, 2832R, 2834-1, 2834-2, 2834R, 2836, 2836-1, 2836-2, 2837, 2838, 2839. 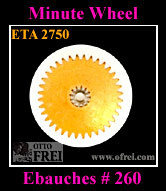 Escape Wheel ETA 2801-2, 2804-2, 2836-2 and many more calibers. Double corrector operating lever Ebauches number 2570 found in the ETA 2801-2 is also used in ETA's 2804-2, 2821-2, 2824-2, 2824-A2, 2826-2, 2834-2, 2836-2, 2846 and Longines calibers: 639.2, 640.1, 641.1. A second image and another view to take at look at! 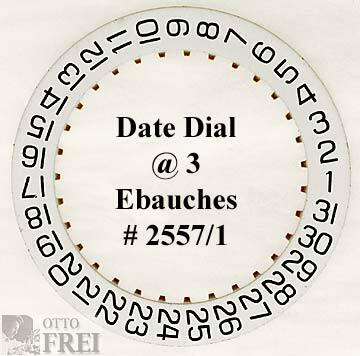 Ebauches Part #2780 Call it a Gib for Day Disk (Day indicator spring-clip) or Date Dial Clip or refer to it by the Ebauches part number 2780. 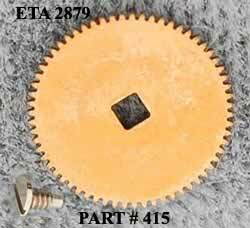 ETA 2801-2 Part # 203 Intermediate Wheel also called "Offset Center Wheel"
This image is of the set wheel found in level 1 ST 96 movement. Standard height found on models with a sweep second hand. 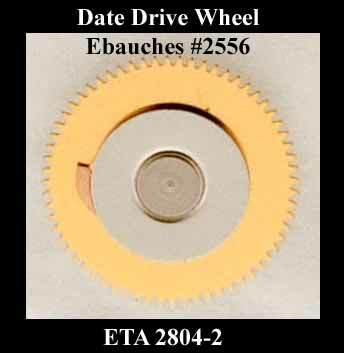 Use with a 2.20 mm height cannon pinion and a 1.25 mm high hour wheel. 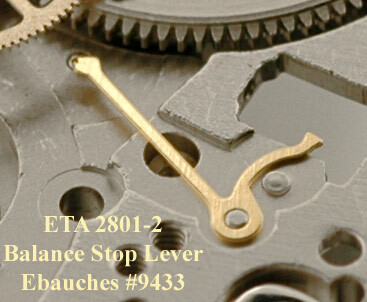 This height is the height used on ETA 2801-2 movements, which do not have a sweep second hands. 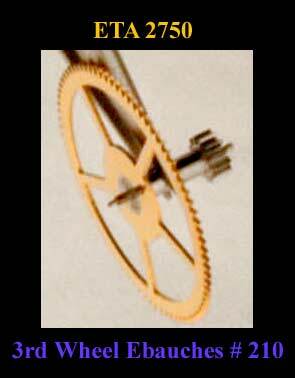 When using the 4.15 mm height 4th wheel the cannon pinion needs to be 1.95 mm and the hour wheel 1.00 mm. Set Bridge Screw For ETA 2801-2, 2804-2, 2824-2, 2834-2 and 2836-2. This screw is also for the following calibers: Sellita SW200-1, SW210-1, SW215-1, SW220-1. 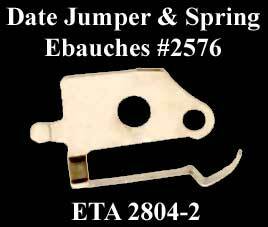 Also the date jumper guard screw Ebauches #52595 for ETA 2804-2, ETA 2824-2, 2834-2, 2836-2, Sellita SW200-1, SW215-1, SW220-1. 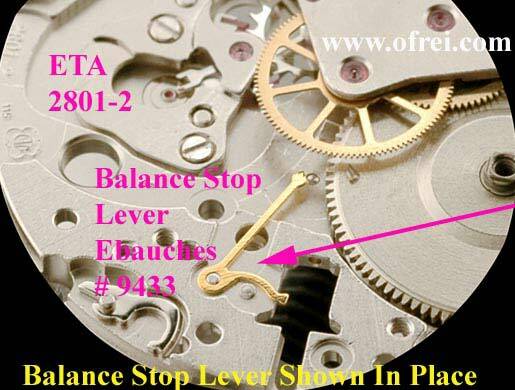 For for automatic movements used by ETA, Benrus, Bulova, Hamilton, Longines, Lucien Picard, Movado and Tissot. Regular length 16 mm stem is the one that you will need for most watch cases that are 40 mm or less in diameter. 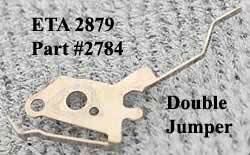 ETA 28,800 ETA Set lever to fit these popular calibers. To fit what? Good question. Case clamps are really a case part and not a movement part. Now, the cases we sell for example comes with a plastic movement ring and does not make use of case clamps to hold movement in place. Some people have requested case clamps and we can supply a popular clamp used with the following movements.